This post “How to download Udemy videos for free to PC or Mobile devices?” is to address the problems faced by our regular readers who were able to find and learn Udemy courses for free but couldn’t download and learn from those Udemy courses offline! With the advancement in the technology and improvement of internet speed, learning and acquiring the knowledge has never been easier. Rise of distance learning or online learning, or say, e-learning platforms have made the learning task enjoyable and accessible from any remote areas. Among all of the rest e-Learning platforms, with more than 30M students, Udemy has been one of the leading ones in this industry. Udemy is the go-to place for both the students and the mentors to acquire or to share the knowledge. Udemy, themselves, run different campaigns offering the courses for the heavily discounted price. However, the mentors or instructors, too, do run their own free Udemy course coupon codes giveaways and discounts. All of those free Udemy courses coupons are curated and listed by the third-party websites. We’ve already compiled some of the best free Udemy courses coupons listing websites here in How to get Udemy courses for free? 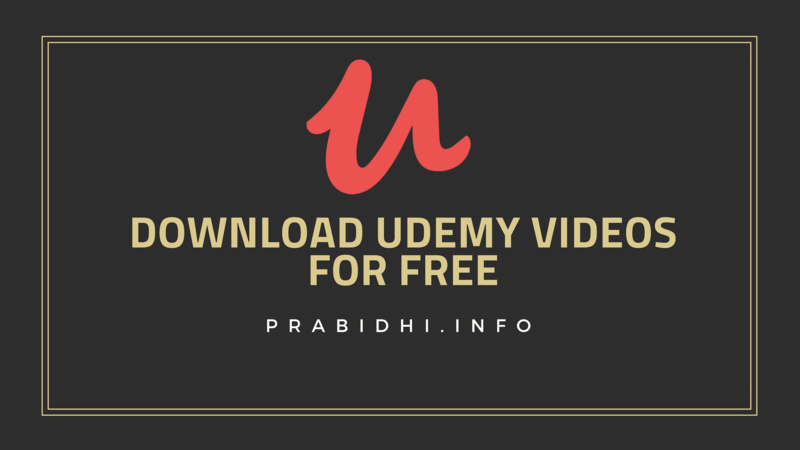 However, despite legitimately getting the desired Udemy courses for free, there has been some problem regarding on how to download Udemy videos for free! To which, we are here again to address the issue and list all the possible methods to download videos from Udemy. According to Udemy officials, downloading Udemy videos directly to PC is kind of forbidden unless the instructor enables the downloading feature for that lecture. However, there are some software/tools to download Udemy videos for free. Moreover, here we will be sharing the legit methods to download the Udemy videos for free! Disclosure: Though the Udemy officially supports downloading Udemy videos for free on Android and iOS, it doesn’t support for PC/Web version. So, the open-source tools are here to help you to download Udemy videos for free, but only you have paid for or obtained the paid Udemy courses for free in a legal way like applying Udemy 100% off coupons or promotional codes. Also, the open source tools were developed keeping the third world countries where internet speed are comparatively slow to stream the Udemy courses in an uninterrupted way! To download Udemy Video to PC, actually, there are two methods discussed below! Here we are sharing the genuine and legit ways on “how to download Udemy videos for free.” These methods are only applicable to download Udemy videos of the courses you’ve paid for, or you’ve enrolled into. This software can’t merely just download any paid Udemy courses for free. 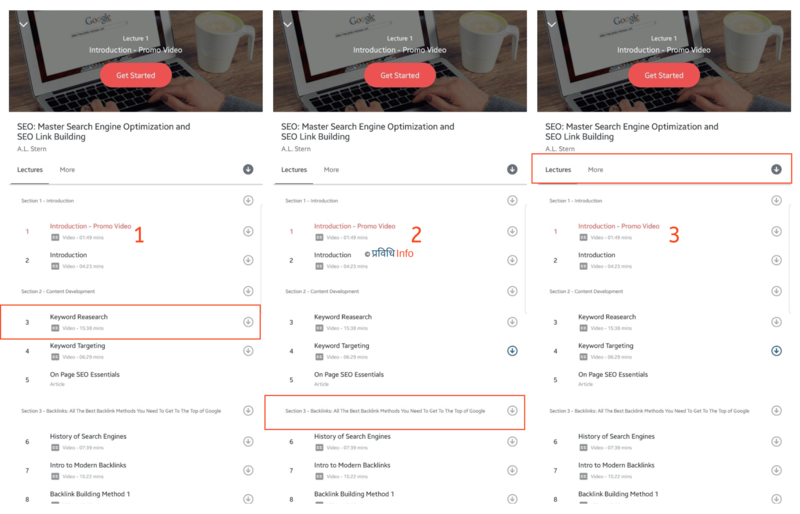 So, we do encourage to scrape multiple websites or read our previous post on How to get Udemy courses for free? 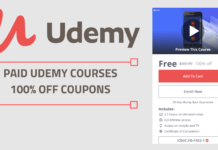 to find the 100% off coupons or discount coupons for your favorite/desired Udemy courses and then only follow these methods! Click on the Instructor’s name, and you’ll be redirected to his/her profile page. Now compose a constructive message requesting to enable the download feature to download Udemy courses prepared by the instructor. Play any Udemy courses you want to download the lecture from. 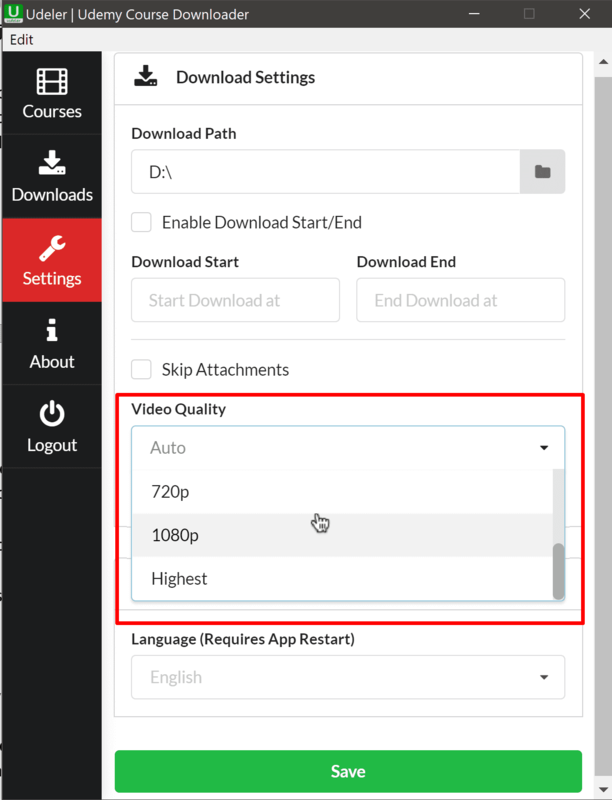 Set the video quality to the desired resolution you want to download in. Click on “gear” icon and select “Download Lecture” to download Udemy videos for free. There are few mentionable open source tools to download Udemy Videos for free. Some require a little bit of python-language knowledge, however, we’ve shared the one for general non-techie users. Udeler is an open-source tool to download Udemy Videos to PC without any need of coding knowledge. Udeler has both web version and standalone software version for Windows, Mac, and Linux platforms. Using Udeler is easy and straightforward. For guidance, follow these simple steps to download Udemy videos to PC. Visit the Github page for Download Udemy videos to PC using Udeler software. Scroll to the “Download” sections and choose your corresponding platform to download the tool. The login page requesting for your Udemy login credentials will show up. Enter it. Now all your courses are displayed. Choose the download path, desired video quality and the download start point and end point, and save the settings. Tap on the “download icon” and all the lectures videos of that course will be downloaded to your selected download path. A pop up for that course will appear and choose any of the lectures of Udemy videos you want to download. You will get a download link for that lecture. If you have downloaders like IDM, Ant or any other, a dialog box will appear to confirm the download. Many torrent websites offer to download paid Udemy courses for free, but we should not get encouraged to use those torrent websites. Rather than just visit the websites that give Udemy 100% off coupons courses to get the desired courses for free or for a discounted price. Why shouldn’t we download Udemy videos for free from a torrent? Because it’s unethical and illegal to download from torrent. You are downloading Udemy paid videos for free without proper credit to the Instructor. Unlike in the above mentioned methods, you’re not enrolled in the courses, so you won’t be able to track the courses progress and updates. Unlike for the web version or PC, Udemy officially offers the feature to download Udemy videos for free on their mobile devices. You can download and save individual lectures, sections or entire complete courses. However, the practices and the quizzes might be downloaded when downloading Udemy videos! Both the official Udemy Android and the iOS Udemy app has this feature. 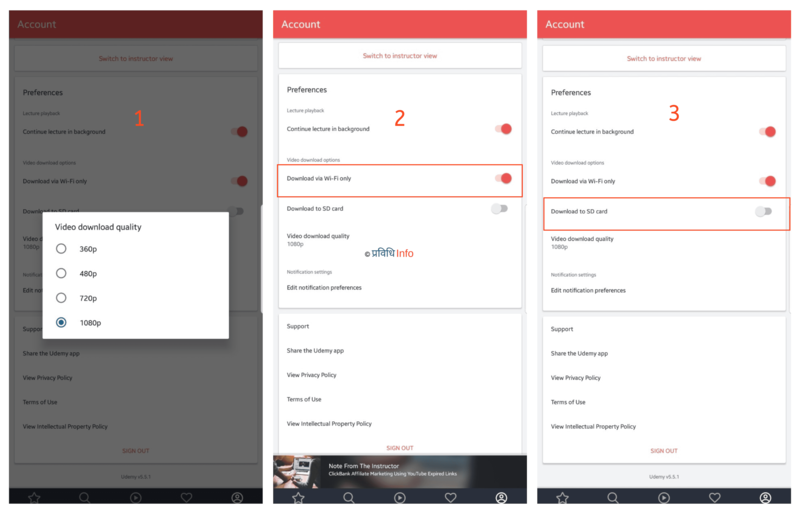 However, before you are set to download Udemy videos for free on your mobile devices, you should make sure you have set the following options appropriately. Log in to your Udemy Android or iOS app. Tap on the “Account” icon at the bottom right hand of the home screen. This option is available to Udemy Android app only, and this will enable to download Udemy videos directly to SD card! Download Udemy videos for free on Android and iOS. You can download individual lectures, sections or entire courses! Go the Udemy course, and tap on the grey “Download” icon right by the lecture title. The download icon turns greenish blue when the lecture download is complete, so to delete the downloaded lectures, just tap on that same download icon and select “Delete” from the pop-up dialog box. Tap on the “download” icon right by the section title. Tap on the “download” icon right by the course title. Select “Download Course” option from the popup. Well, that is all to get you going with the downloading Udemy Videos for free to PC or Mobile devices. Disclaimer: The process of downloading Udemy videos to Android/iOS is officially provided by Udemy. However, the downloading Udemy videos to PC is not officially provided by Udemy. So, we do not hold responsible if you reproduce, redistribute, transmit, assign, sell, broadcast, rent, share, lend, modify, adapt, edit, create derivative works of, sub-license, or otherwise transfer the content you’ve downloaded.